All the strategy posts listed in one spot. Gore Piles, smoke and morale – explained. 10 tactical tips every Musket Smoke commander should know. A Cold Week In Naarden – Tips#2 – Howitzer Bridge. A Cold Week In Naarden – Tips#3 – The Wheat Fields. A Cold Week In Naarden – Tips#5 – Winter Keep. A Cold Week In Naarden – Tips#6 – Artillery Transport. 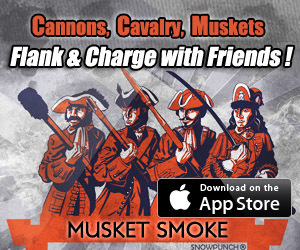 Musket Smoke Classic – Manual.